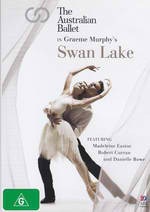 Australian Ballet Swan Lake DVD from DVDLand. In master storyteller Graeme Murphy's hands, the world's favourite ballet becomes a witty, dramatic and ultimately devastating story of love and betrayal. It's a familiar tale - a love triangle between a princess, her prince and a woman with a prior claim on his heart. Murphy's choreography is at once homage to the grandeur of 19th Century classicism, and an invigorating update that speaks compellingly to the audiences of today. At the centre of this brilliantly danced work is a trio of performances by principal artists Madeleine Eastoe, Robert Curran and Danielle Rowe that has been acclaimed around Australia and the world. Tchaikovsky's peerless score, and the extraordinary settings and costumes of Kristian Fredrikson, finish off a production that according to Le Figaro 'puts fire into the Lake'. Click the button below to add the AUSTRALIAN BALLET - SWAN LAKE to your wish list.